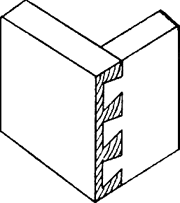 A dovetail at an angle in which the pegs of one member do not pass through the full thickness of the other; esp. used at the front of a drawer. The arches and beams were connected using lapped dovetail joints.